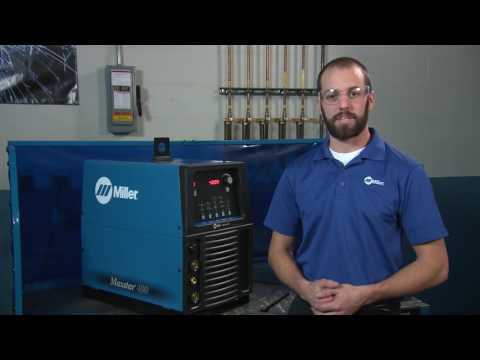 The Maxstar 400 is a powerful, compact power source capable of welding up to 5/8” material. High speed pulse control provides maximum productivity and weld quality while conserving energy compared to traditional welding machines. Exceptionally smooth and precise arc for welding exotic materials. High-speed DC TIG pulse controls - Pulse frequency capable of pulsing 5000 pulses per second. Pulsing adds arc stability, reduces heat input and warpage and can increase travel speeds. Other parameters include peak amperage, peak time and background amperage. Tailored arc control (DIG) allows the arc characteristics to be changed for specific applications and electrodes. Smooth running 7018 or stiffer, more penetrating 6010. Hot Start™ adaptive control provides positive arc starts without sticking. For more consistent non-contact starts and greater reliability compared to traditional HF arc starters. Program memory features 9 independent program memories that maintain/save your parameters. An integrated 120-volt dedicated-use receptacle to power the Coolmate™ 3.5. The power switch on the Dynasty also activates the receptacle to help prevent torch failure. Allows meters to be calibrated for certification. Allows for any input voltage hookup (208 - 575 V) with no manual linking, providing convenience in any job setting. Ideal solution for dirty or unreliable power. Front panel memory card data port provides the ability to easily upgrade software and expand product features. Visit MillerWelds.com/tigsoftware for the latest software upgrades and expansions.